There were 6.4 seconds left in the Ducks season, and a berth in the NCAA tournament hung in the balance. It was the semifinals of the Pac-12 Tournament and defending champion Oregon had put its season in the hands of senior Joseph Young. Dribbling the length of the court, Young pulled the trigger from beyond NBA range and netted a game-winning basket that ultimately sent the Ducks to the NCAA tournament a few days later. Young left his mark at Oregon as a prolific scorer. Fast-forward to present day, and Young is still dazzling crowds for the Indiana Pacers’ summer league team. Though a second-round pick, in his first three summer league games Young has averaged 20.7 points. The Pac-12 will miss his electrifying scoring abilities this season, but the Ducks will also have to fill the void of leadership Young filled for the past three seasons. Another change looms next season, one that should be much easier to adapt to: the shot clock change. The 35-second shot clock is brutal, especially at the end of games when teams attempt to burn clock. In an article by Nicole Auerbach of USA Today Sports, Auerbach discusses the June 8, the NCAA committee approval of a reduced 30-second shot clock. The new rule will promote a faster pace of play and will hopefully improve the abysmal 67.6 ppg for Division I basketball teams last year. 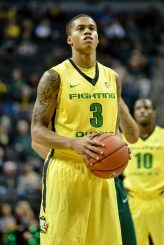 Yet a fast-paced offense is the staple of the Oregon Ducks basketball team, as it finished 26th nationally in scoring at 75.6 ppg last season, per ESPN. The shorter shot clock coincides nicely with Coach Dana Altman‘s very successful recruiting class arriving in Eugene this year. With the likes of five-star shooting guard Tyler Dorsey, as well as four-star point guard Kendall Small and four-star power forward Trevor Manuel, these incoming Ducks will have to adjust to the increased tempo which has helped the Ducks be so successful in prior seasons. Dorsey, the 38th-ranked recruit in the nation, averaged 34 points per game during his senior year for Maranatha High School in Pasadena, California. With his natural ability and the tutelage of Altman, the Ducks may not skip a beat this season, despite Young’s absence. 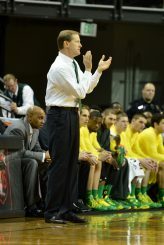 Coach Altman will provide leadership to these hungry Ducks. Seniors Elgin Cook and Dwayne Benjamin will anchor a young Oregon team, but they will have help from newly acquired transfer, Dylan Ennis. Chris Godfrey of “Bustingbrackets.com“ wrote an article about the new Duck and his role. Ennis started every game for coach Jay Wright and reigning Big East champion Villanova. The hard-nosed point guard looks to become the top option for a team that has just lost the Pac-12 Player of the Year and scoring leader, Joseph Young. Although Ennis only averaged 9.9 ppg last season, those numbers conform to the balanced attack Villanova prides itself on. More importantly, the addition of Ennis should help fill the leadership void vacated by Young. Ennis also brings the physicality of Big East basketball to the Pac-12, a conference that is well known for its athleticism and speed. The Pac-12 conference is wide open this year with usual frontrunner Arizona losing its star players to the draft. The combination of veteran leadership from Cook and Ennis, alongside energetic and talented underclassmen such as Dorsey, Dillon Brooks and Jordan Bell, will contend for the crown. 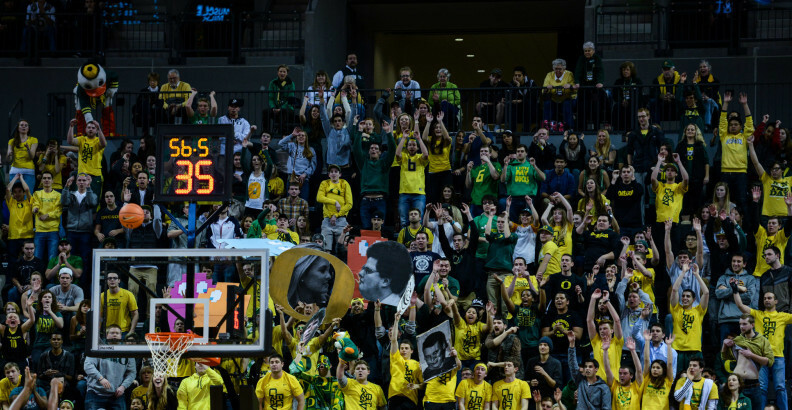 And the Ducks high-octane style of play will lessen their adjustment to the new shot clock, furthering their advantage heading into what could be a banner year for Oregon basketball.